Needless to say, living in Boston this week has been pretty hectic. It has been emotionally draining and exhausting, even to those who were not directly impacted by the week's events. After the week that we have had, a day for rest and creature comforts is a welcome change of pace. 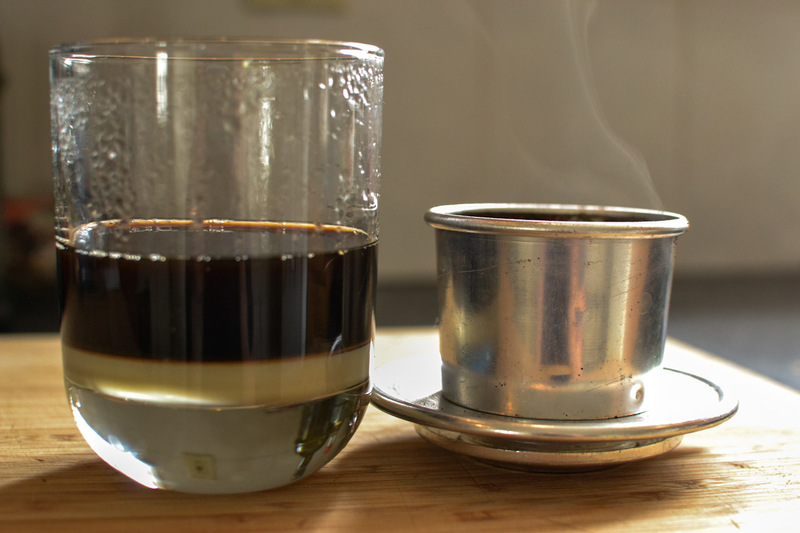 Ever since our trip to Vietnam, I go through periods where I get intense cravings for Vietnamese coffee. Vietnamese coffee is much different than western coffee, it is incredibly strong stuff - jet fuel by way of coffee beans. Often served with condensed milk, both hot or iced, it was a treat for me to have in the afternoons, especially during our motorcycle trip through the mountains, when my ears were numb and I had been huffing 2-cycle exhaust for hours. I had never seen the little drip coffee makers that were ubiquitous throughout Vietnam, so I picked one up in Hanoi before heading home. I also bought a couple of bags of ground coffee to keep my addiction going. Of course, upon returning home, I failed miserably at making the small potent servings of coffee, instead getting watery runoff that obviously left most of the coffee flavor in the grounds. I would search the internet for tips or how-to's and found nothing but advice that did nothing - convincing me of everything from the grounds being both too fine and too coarse, needing to tamp the grinds, or needing an entirely new coffee dripper (which I had a hard time believing considering mine was no different than the ones I saw in Vietnam). I attempted and gave up several times over the course of a year and a half, before finally coming across the secret. I hope that sharing this with the blog world will get more westerners into this stuff, because it is absolutely phenomenal. The coffee dripper can be found on Amazon for as little as $3. I have seen fancy ones that include clamps and screws for tightening filter plates and all kinds of features, but you don't need anything more than what is pictured above: a perforated saucer, a well for the grinds and water, and a lid. You also will need coffee. You can find coffee beans grown in the central highlands of Vietnam, or some sources say to use coffee with chicory added (Cafe du Monde coffee, based out of New Orleans, is the most widely available source for chicory coffee). The coffee that I bought in Vietnam did not have any chicory added and I will probably try sticking to a dark French roast when my last bag is empty. Start by bringing water to a boil on the stovetop. If you would like condensed milk, spoon some into a glass (standard amounts are anywhere from ¼-½ of the amount of coffee). 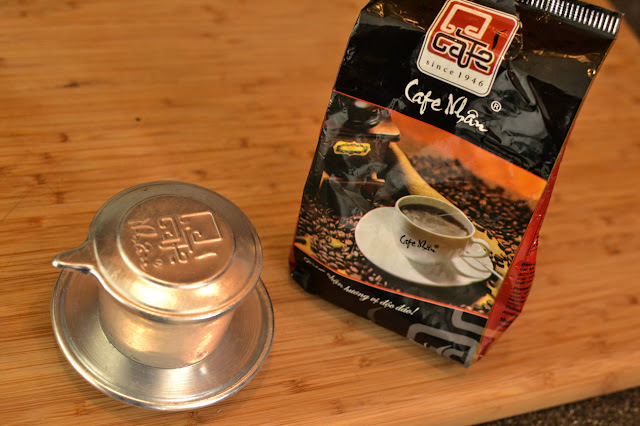 If needed, grind the coffee finely (nearly espresso grind), then add 2-3 tablespoons of coffee to the drip well. 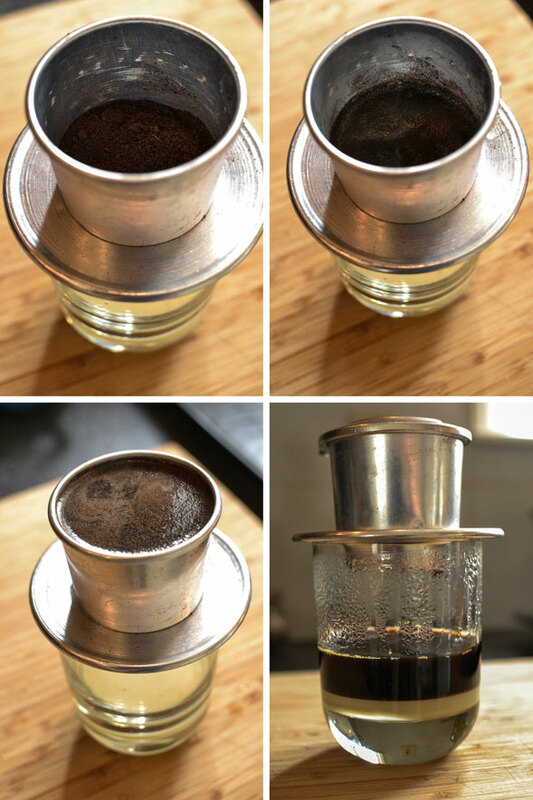 Place the drip well into the saucer and place the whole filter on top of your glass. When the water is boiling, add JUST enough water to cover the grinds in the well - probably 2 tablespoons or so. Wait for the grinds to soak up the water, you can check by tapping the side of the well, if the water sloshes then it is not quite ready. When the grounds are soaked but not sloshing, spoon in enough boiling water to fill up the well, and put the lid on. It will take a minute or two for the drip to begin but you should see one part of the filter start to drip. Get ready for liquid gold. Start to finish, making a cup of coffee could take upwards of 5 minutes. You can lift the lid to make sure that all of the water has dripped through, and when the coffee is ready, simply take the lid off and flip it upside down. 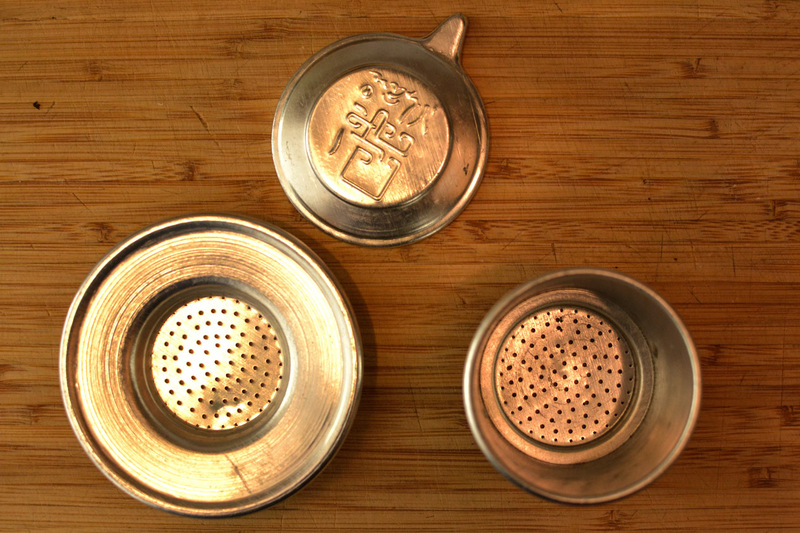 Take off the saucer/well and place them on the inverted lid and you have a safe and no-fuss way of setting aside your used grounds until you want to deal with them. Stir to mix in the condensed milk and enjoy. Take baby sips and make it last, it is worth it.